Warner Bros. reports that The Hobbit: The Desolation of Smaug is up to $131.2 million overseas, pushing its global total to $205M. Germany – Took 64% of the top 5 market share, ranking as the biggest opening of 2013 with €13.2m (US$18.1m) from 1,460 screens. HDOS already qualifies for a Bogey Award for achieving more than 1,000 admissions per site. 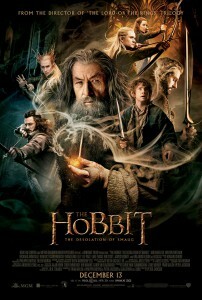 Opening results surpassed The Hobbit: An Unexpected Journey by 14% (€11.5m), excluding previews. The UK: With a 61% share of the top 5 films in the market and nearly quadrupling 2nd placed FROZEN, the opening results are excellent at £9.5m (US$15.6m) from 1,495 screens. This is on par with the. Fri-Sun opening results for HAUJ (£9.5m).